In 1991, Bruce Rich traveled to Orissa and gazed upon the rock edicts erected by the Indian emperor Ashoka over 2,200 years ago. Intrigued by the stone inscriptions that declared religious tolerance, conservation, nonviolence, species protection, and human rights, Rich was drawn into Ashoka’s world. Ashoka was a powerful conqueror who converted to Buddhism on the heels of a bloody war, yet his empire rested on a political system that prioritized material wealth and amoral realpolitik. This system had been perfected by Kautilya, a statesman who wrote the world’s first treatise on economics. 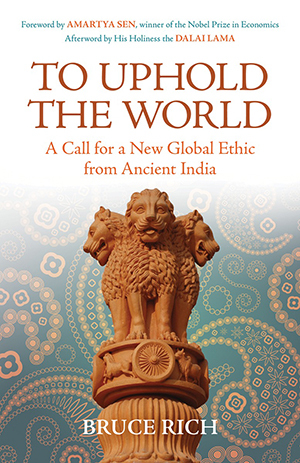 In this powerful critique of the current wave of globalization, Rich urgently calls for a new global ethic, distilling the messages of Ashoka and Kautilya while reflecting on thinkers from across the ages from Aristotle and Adam Smith to George Soros. "The book's message is inspiring and wise. . ."